We dive deep into one of Hollywood’s best and most interesting modern franchises this week with the Mission: Impossible series. The latest in the Tom Cruise action series, Christopher McQuarrie’s Fallout, is out this week, and we gush enthusiastically over its greatness at length. But as Sean recently went through the first five films for the first time, we also talk about those as well, setting the context for a series that has been around for over two decades and still has enough gas in the tank to deliver its best film on its sixth time out. 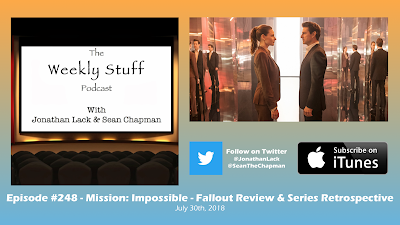 Jonathan also talks about discovering the incredible work of Chinese director King Hu, Sean tells us about a Spider-Man concept album, and we lament over corporate consolidation in discussing the Disney/Fox merger that was approved earlier this week.